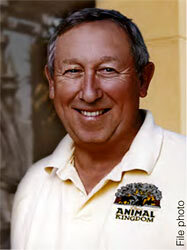 Roy E. Disney, who served on The Peregrine Fund’s board of directors for 22 years, died on 16 December 2009 at age 79 in Newport Beach, California. He served as chairman of the board from 1990 through 1992. "He was one of our most beloved members,” said J. Peter Jenny, president and CEO of The Peregrine Fund. “He and his family have been among our most ardent supporters." Roy was a wellknown conservationist and had a particular interest in birds of prey. He met the late Morley Nelson of Boise—an international raptor expert, falconer, and former Peregrine Fund board member—during the filming of Perri the Pine Squirrel, a 1957 film that follows the life of a pine squirrel through the seasons of her life. Roy was a cameraman and Morley flew a Goshawk for the film. Later, Roy met Peregrine Fund Founder Tom Cade during the production of the 1968 documentary Varda the Peregrine Falcon, which reflected Roy’s desire to save the falcons from extinction. Roy’s associations with Tom and Morley led to his becoming a member of The Peregrine Fund board. A nephew of Walt Disney, Roy played a key role in revitalizing The Walt Disney Company and its animation legacy during his 56 years with the company. He had a hand in several artistic and box-office hits, including The Little Mermaid, Beauty and the Beast, and The Lion King. Roy’s first years were devoted to working on nature films, which also included The Living Desert and The Vanishing Prairie.